Tartar sauce with fish is so delicious, but typical recipes contain a lot of mayonnaise that is just way to easy to gobble up. I’ve recently bought some frozen, breaded fish to keep in my freezer for last-minute meals. I’ve also got some pickles and yogurt and a few other bits and bobs in the fridge that I can use to whip up this yummy sauce. 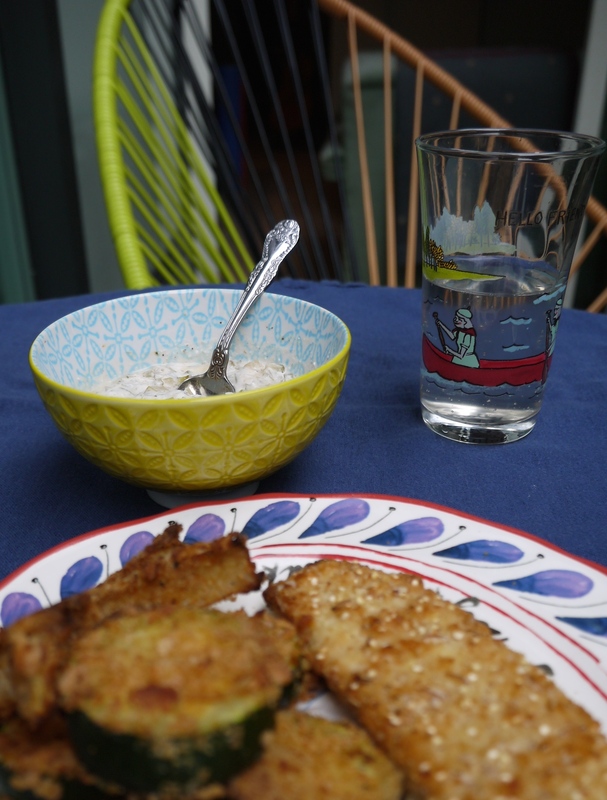 I served the fish and tartar sauce with oven-baked breaded zucchini and baked onion rings. The tartar sauce is a nice dip for those too. If I was in more of a hurry I would probably have just eaten it with some frozen peas, making it a great last-minute meal! The amounts are estimates, so you’ll have to taste it and see what you think you need to add more of. Combine the Dijon and yogurt. Add everything else. Mix it in. I like quite a bit of pepper in mine, but taste and see what you think.